Our product range includes a wide range of meera saree, cotton weaving saree, designer printed sarees, colourful designer printed work sarees, simple printed saree and glittering & sparkling saree. 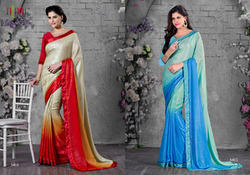 The word sari is derived from Sanskrit which means 'strip of cloth' and in Prakrit, and became sari in Hindi. The word 'Sattika' is mentioned as describing women's attire in ancient India in Buddhist Jain literature called Jatakas. This could be equivalent to modern day 'Sari'. 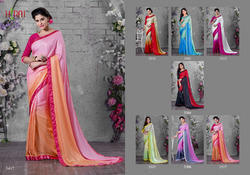 The word Saree is derived from Sanskrit which means 'strip of cloth' and in Prakrit, and became saree in Hindi. The word 'Sattika' is mentioned as describing women's attire in ancient India in Buddhist Jain literature called Jatakas. This could be equivalent to modern day 'Saree'. In the history of Indian clothing the saree is traced back to the Indus Valley Civilization, which flourished during 2800–1800 BC around the western part of the Indian subcontinent. The earliest known depiction of the saree in the Indian subcontinent is the statue of an Indus Valley priest wearing a drape.